Image: Previous CASP recipient, Microscopes in Mullumbimby by Scale Free Network. Photo by Kurt H. Peterson. Arts and culture in regional NSW will continue to shine with an outstanding line-up of new creative projects fast-approaching thanks to over $259,000 in funding from the NSW Government. Through this funding, creative organisations from across regional and rural NSW will play host to range of short-term, locally initiated community productions, programs, performances and workshops. Among the 83 projects selected, the program will support a two-day writers festival for primary schools celebrating and educating students in the power of literacy; a 10-week training program for aspiring theatre-makers working with disability, as well as an ensemble choir of over 100 vocalists accompanied by a 45-piece regional orchestra. The annual Country Arts Support Program (CASP) funding aims to drive creative and vibrant state-wide arts projects that engage diverse audiences and promote an innovative NSW arts and cultural sector. Increasing access and participation in arts and cultural experiences will help drive economic benefits across the regions and also enables positive social impacts too, including greater awareness, appreciation and expression of our cultural diversity. 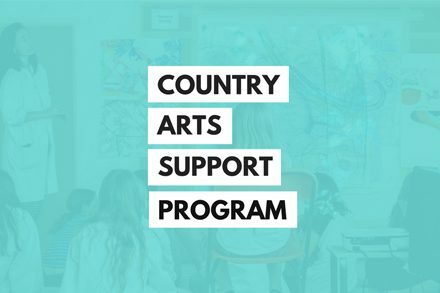 The Country Arts Support Program fund is a devolved grants program administered each year by Regional Arts NSW on behalf of Create NSW. Grants of up to either $3,000 or $5,000 (depending on region) are available primarily for professional artists’ fees, travel and accommodation, with applications assessed by 14 regionally-based panels coordinated by the local Regional Arts Boards. For further information on arts, screen and cultural funding, including targeted support opportunities, email arts.funding@create.nsw.gov.au. Funding will allow the Allegri Singers to deliver performances of The Armed Man by Karl Jenkins, in Bathurst and Orange in November 2019. The production, directed by William Moxey, will involve a 100+ voice choir (comprising the Allegri Singers, Orange Conservatorium Symphonic Choir and the Willoughby Singers), a 45-piece regional orchestra and vocal soloists. Anaiwan and Gumbaynggirr artist Gabi Briggs will deliver a one-day workshop where Aboriginal matriarchs and family will work together using techniques of re-colouring and collage. They will take ownership of photographic imagery while sharing and reclaiming community histories. Badger Bates and Justine Muller will work with students of Wilcannia Central School to design and produce a mosaic for the public. This artwork will celebrate the importance of connection to the Darling River for the next generation of Barkandji people. Bandon Grove School of Arts Inc: Community Ceramic Tile Project (Upper Hunter, Hunter) ($3,000) Artists Clare Tillyard and Alexandra Wade will work with the children of Bandon Grove community to construct, decorate and install ceramic tiles on the community pizza oven at Bandon Grove School of Arts. This project will design and paint an Aboriginal mural, to be hung in Bathurst Seymour Centre (BSC). By working with a local Aboriginal woman, Nicole Trudgett, this project will contribute to important relationship-building between the BSC and the Aboriginal community. Funding will be used to facilitate a series of five workshops for young Aboriginal women from Armidale. They will be mentored by older women while learning new arts and cultural skills like weaving, dancing etc. In 2019, local sculptors will collaborate with an engineer on the initial design for a functional public artwork that will serve as a footbridge and pathway to a bush regeneration site. ArtLink is a structured program of performing and visual arts activities connecting youth (18-24 years) with other sectors of the community. Funding will enable a series of workshops to be conducted at the Stables community arts facility run by volunteer arts practitioners. To fund the celebration of the Bellingen Fine Music Festival’s 10th anniversary and its Music-by-Youth Project. The Fabulous Fossils project will develop a mural showing evidence that mega-fauna and Aboriginal people coexisted in the Cuddie Springs area for more than 10,000 years during the Pleistocene era (Ice Age). This project seeks to develop a showcase for Wilcannia Dance Group to take a choreographed performance to Broken Hill. It will create the experience of touring and semi-professional performance conditions for an amateur dance group consisting primarily of young Indigenous people aged 15 and up. Mark Walton, an inspiring music teacher, composer and performer, will run orchestral workshops in Broken Hill in April 2019, open to orchestra members and the wider community. The workshops aim to increase the musical skills of participants and expand the orchestra’s repertoire and will culminate in a public performance. Through a series of workshops with cultural mentor support, a group of Hay Aboriginal Elders and community members will have the opportunity to learn and experience traditional weaving skills and techniques. Byron Youth Theatre (BYT) will explore the issues of abuse (physical and psychological) by performing an original production and conducting workshops at schools in local communities. BYT members will receive mentoring by relevant organisations as part of this process. This project will see audio book narrator, actor, producer and comedian Stig Wemyss visit Cessnock City Library to promote its audio book collection. The project aims to help introduce reluctant readers to a world of stories. Through a series of workshops, local artist Scott Cooper will help people with disability to develop individual skills in visual arts and produce their own artworks as well as a collective mural. Klironomia will be a community heritage project to provide history on the local Greek migrants’ inter-generational lifestyle in the local Australian community. The project will encompass both full and abridged versions of oral history, digital storytelling, a photo essay and ‘memory boxes’ to inform individual stories. Funding will be used to engage artist Skye Bragg to run a series of coppersmithing workshops in Cobar as part of the inaugural Grey Mardi Gras festival in April 2019. Commencing with a celebration song about a shared sense of place and things that bring people together, local HipHop artist Nate Weatherall and Sydney-based producer Daniel Neurath will conduct a two-day workshop teaching production and writing skills to young people from the local tribes of Armidale. The Search For The Sparkle theatre workshop for 7-12 year-olds aims to support selfesteem and resilience in young people in an effort to address high rates of depression and anxiety. The workshops will culminate in a short performance and video to be shown at Cooma Little Theatre in March 2019. Over a period of three months, the community art studio will host professional workshops in acrylic, oil, water colour techniques, the foundations of art and design, art theory and history. The workshops are open to beginners as well as those looking to develop and build on existing skills. Cootamundra Strings Youth Orchestra’s Inception project will support the establishment of a youth string orchestra in Cootamundra, addressing musical education, performance, artistic development and community engagement. Based at The Arts Centre Cootamundra, the orchestra will be led by Artistic Director Katie Spicer and involve all local schools. The Dog on the Tuckerbox walkway underpass is a site which is used for tagging and/or street art. This project will create a themed mural to improve the aesthetic of the space using constructive art. This project supports the growth of Community of Practices Emerging (COPE) – a group of artists from the Bega Valley who are interested in multi-disciplinary collaborative performance. In 2019 COPE will meet every six weeks to develop and practice in context with one another, culminating in a public end of year performance. Creative Wauchope Workshops are an integral part of the Creative Wauchope Festival, held for the first time in 2018, and aim to make creative experiences accessible to everyone. Funding will be used to support a night of music from ‘overseas and Australia’, held in the memorial hall at Dalgety. The night will appeal to a wide range of people, including locals who have little opportunity to experience music of such quality, and visitors to the town. In a series of workshops for young people, Dubbo Filmmakers aim to provide handson experience in creating short films facilitated by experienced filmmakers. Young filmmakers will be encouraged to enter their projects in the 2019 Dubbo One Eye Film Festival. To bring the world of art to kids from the bush, three qualified artists from Sydney will present art workshops to 150 students at Dunedoo from 14 – 16 May 2019. A renowned Yorta Yorta artist and Elder will be engaged in recognition and celebration of Indigenous culture of the area. The artist will work with the children of Finley, Berrigan and Tocumwal to develop and create an installation that will be unveiled during NAIDOC week 2019. Sketchbook Library is based on a sketchbook being used to create ideas. Sketchbook Library enables the artist to make meaning of images from the library or outside of the library through the creating and communication of their own artwork, helping those with low written and verbal communications especially. A vibrant and inclusive program of art workshops and related exhibitions for the young and the young at heart will be offered to local children and adults across 2019. Funding will be used to deliver workshops on writing and short film-making ahead of a Short Film Festival. The Festival’s winners will be announced at an Awards and Premiere screening evening, where all entries will be shown on rotation. Local Greater Hume Libraries and Art Groups will help build community spirit by creating pictures of important community members or their contributions. These pictures will be displayed in a travelling exhibition in three libraries: Holbrook, Henty and Culcairn. Nagami-Li Nugurrugu (To See Tomorrow) is a street art and mural project in Gunnedah’s CBD that will explore contemporary and traditional indigenous arts practices, stories and symbols. To promote community wellbeing and connection in 2019, drumming programs for up to 30 youth and seniors will be offered with the aim of helping to reduce emotions such as anger, anxiety and loneliness in the local youth, Aboriginal, people with disability and elderly populations. Aimed at inspiring the local community and providing a fun new visitor experience, this project will install three new public art pieces in the township of Hillston based on the Emu, which is integral to the landscape and community region. A reading of Jane Harrison’s Stolen will be presented in the first half of 2019, supported by Anni Gifford, and drawing on alumni from the Black Border project. This will strengthen the connection with the Indigenous community and provide opportunities for emerging Aboriginal artists to deepen their theatre skills. Wiradjuri artist David Dunne will present visual art workshops for students and parents, culminating in a wall mural. The artwork will be prominently located to inspire interest in local Aboriginal history and cultural connections with the land and the environment. Young people aged 12-18, invited from local schools, youth groups and diverse communities, will construct sculptures of Black Swans from paper and cane. These swans will be mounted and carried by youths in the 2019 Sapphire City Festival Parade. A two-day writers festival will celebrate literacy for ten small primary schools in both Harden and Jugiong. During the festival, students will experience a variety of workshops exploring local cultural history through creative practices. Local professional street artist, INDO The Artist, will work with local youth to create and install a collaborative public art mural in the local skatepark in April 2019. As part of the project, workshops in street art and design technique showing demonstrated pathways into the creative industries will also be delivered. Funding will support Lachlan Arts Council in engaging local youth drama participants to hold a live production of Anne of Green Gables or Shrek Junior at the Parkes Little Theatre in 2019. In 2019 Leeton Shire Council will invite Aboriginal Cultural Groups to host cultural activities to celebrate the history, culture and achievements of Aboriginal and Torres Strait Islander peoples as part of NAIDOC Week Celebrations. Small Art Adventures is a class-based project designed to introduce preschool-age children to arts and craft, have fun and be creative with others. Artworks will be centred around a theme to suit their skill level, age and preference. This project envisions an historic interpretation of ten Indigenous panels depicting presettlement in Lockhart. The public artwork, involving both the Aboriginal and nonAboriginal community, will be planned and designed by Wiradjuri artist and former Lockhart resident expert mosaic artist/designer Francessca O’Donnell. Mentored by a writing expert and a graphic designer, young people in the community will interview and photograph people they feel are making a difference in the community and create a professionally designed and displayed book. Renowned Australian silversmith Skye Bragg will deliver a one-day silversmith course in 2019. The workshop will be held at the Marra Hall, which is a central meeting place for the isolated community. The Wee Jasper community and visitors will be invited on an artistic journey through a range of art workshops in October 2019. Each workshop will be set in an idyllic location to inspire creativity and capture the tranquillity and beauty of the village. The Moama Play Park committee will liaise with a local artist and Secondary College staff to research local sporting legends. Once determined, the students and artist will create designs that can be adapted onto eight wooden bollards in the park. A workshop program will deliver a series of training opportunities to the members of the Moruya Red Door Theatre Company. It will offer theatre experiences for all ages and speak to various levels of social and cultural experience and economic backgrounds. Offered simultaneously with the local Show n Shine market, there will be two artist workshops and an exhibition open to a selection of emerging and more established artists. Young people in the Western Riverina with an interest in furthering their musical studies will have access to diverse and interactive workshops led by high quality music teachers and musicians. This project is Phase One of MACC’s contribution to the revitalisation of Murrurundi and will offer sculpture workshops for all ages. Art will be the narrative of its people and the natural environment and a priority of the Murrurundi Revitalisation Plan and the Murrurundi River Trail. This initiative will reinstate skills that have been lost since colonisation and bring members and friends of Mutawintji LALC together in friendship and learning, with training broadening the members’ talents in cultural arts and crafts. Literary artist Kate Rotherham will deliver a creative writing program aimed at building capacity within the aspiring writers of Narrandera. This workshop series marks the commencement of a collaborative program between the community’s writers, local media and the local museum to interpret and promote the region’s cultural identity. Narrandera is home to Australia’s largest playable guitar. This project will see the instrument tuned before being professionally recorded to realise music by local composers Fiona Caldarevic, Vic McEwan and Jason Richardson. Community storytelling sessions within the New England Writers’ Centre Stories Connect project aim to engage with the newly-resettled Yazidi refugee community and support community relationship building. Locally based community theatre, artist Angela Frost will collaborate with the community of Barham. Offering creative workshops for students from primary and high school in town, the project will build skills, foster collaboration, and provide a creative outlet for young people in the area. With a focus on positive education, the entire school will create a mural painted on a prominent wall at the school entrance. Pambula Wetlands, Heritage Project and Lonely Arts Club will collaborate to present Ephemeral – an annual one-day festival on Saturday 13 April 2019, celebrating the landscape of Pambula and the creativity it inspires. This will include art, musicians and creative workshops, alongside market and food stalls. The To the Moon and Back art project will invite young people aged 12-17 years to explore space in a series of workshops. Running for six weeks in early 2019, the culmination of the project will be presented in an exhibition to celebrate the 50th anniversary of the moon landing. Zoe Cavedon and Kristy-Lee Denovan will be joining Projection Dance Company Artist in Residence program in January 2019. The artists will share their experiences with the local dance community via workshops and develop their artistry working with Tim Podesta. Around the World is a mentorship program for Junee artist Kellie Hulm to develop new work and present a solo exhibition at Wagga Wagga Art Gallery. Accompanying the exhibition will be a forum exploring supported studios, arts and disability best practice and the National Disability Insurance Scheme (NDIS). During the Banjo Paterson Australian Poetry Festival in Orange in February 2019, bush poet and educator Marco Gliori will deliver school workshops to extend students’ creativity in poetry writing and performing. The workshops will also be run in August 2019 for the 2020 festival. The Lismore African Festival will be held around Africa Day (25 May 2019) and incorporate both indoor and outdoor performances at the Lismore City Hall. Screenwave International Film Festival’s Nextwave youth film program will deliver three free workshops for young people in three Mid North Coast communities, teaching filmmaking and mental health. This project will include two days of workshops led by internationally-renowned countertenor Tobias Cole and local Aboriginal choir, culminating in a public performance at the Brunswick Heads Picture House. This will develop a vocal community and grow cultural networks with the Bundjalung community in Brunswick Heads. The project will commission Australian composer, Andrew Ford OAM, to compose an overture for the Southern Highlands Symphony Orchestra for their Concert Series 3 in 2019. The work will be performed in Bowral NSW and be available to audiences from the Highlands and surrounding regions. Speedforce is an ensemble of theatre makers with and without disabilities living in Albury-Wodonga. With ten weeks of training for the ensemble, weekly sessions will be inclusive and offer accessible drama classes, culminating in a final informal community celebration of their work. Identity – Place will provide an opportunity for local artists and community members affected by the Tathra Wildfires to explore their identity and loss of place through art. Community creative workshops will encourage, develop and explore personal stories through visual arts (including painting, ceramics, and printmaking). World-renowned clown tutor Giovanni Fusetti will work with eight regional clown/theatre tutors and up to 12 people with disability. He will develop a clown/bouffon teaching process for persons with intellectual disability in the Northern Rivers and will mentor tutors in ongoing workshops through 2019. This project is an opportunity for local musicians to learn about the recording studio process, with a focus on how equipment and software techniques can be translated to home studio set-ups. An interactive and creative two-day workshop will be held in May or June 2019, bringing together rural artists to connect art stories with fabric, textiles and natural materials. The workshop will be an expression of sensory and visual art in any medium, creating art in a sustainable fashion. Once a month for six months, this project will offer dementia and other residents from Calvary Care an opportunity to participate in interactive art and visit the Regional Arts Centre. They will be mentored by an Art Therapist and have the opportunity to express their emotions and thoughts. A two-day theatre workshop and community performance in Merriwa with a playwright/director the Cassilian Players will create an original play about the region. A professional ukulele tutor will hold a masterclass in the Upper Hunter for the Murrurundi Uke Group and students from Murrurundi and Blandford Schools. Young people will be taught by a professional photographer how to take high quality photos using their own technology. The course will culminate with an exhibition of their images at the Scone and Upper Hunter Horse Festival 2019. Artist Graham Merrett will engage the community and develop artistic skills by running three weekend garden art and sculpture welding workshops in the Warren community. The 10th Anniversary White Cliffs Music Festival, Best of the Best will feature the Davidson Brothers and Nick Charles. This music project will offer the development of elements including violin-part composition, arrangement of musical accompaniments and research background to create written materials for regional touring. There will be also be a concert to perform the entire set of 24 Italian Songs.